In Avengers: Infinity War, fans got to see one of the most epic fights in the history of the Marvel Cinematic Universe when Thanos finally arrived on Earth for the Mind Stone. And it was all capped off with an epic showdown between the God of Thunder and the Mad Titan. As you can see, the final battle with Thanos was nearly a combination of the two fights with the Avengers, but the Guardians of the Galaxy, Iron Man, Spider-Man, and Doctor Strange ended up being the ones fighting to get the gauntlet off his hands. But at one point, it looks like Marvel was planning that to take place in Wakanda with Captain America, Black Widow, and Thor being the ones to try and remove it from Thanos' grip. 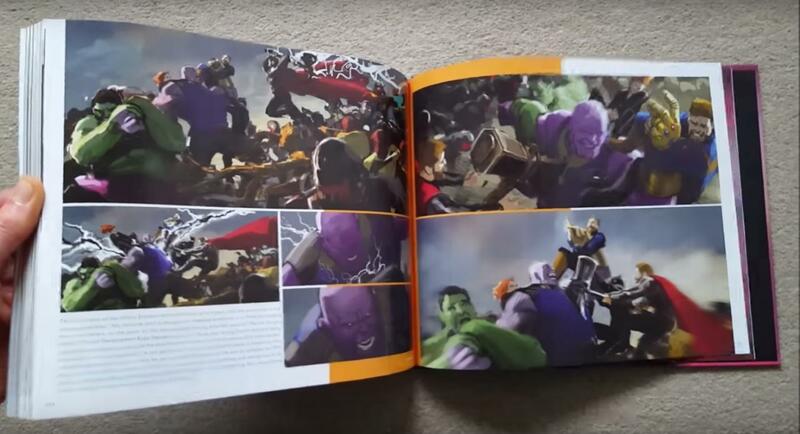 There's even an appearance from the Hulk, struggling to keep Thanos' arm away. It's unclear why they decided to go a different route. Maybe it had to do with Hulk's arc, keeping him off of the playing field and having to alter their plans because of it. It actually worked for the best, because Thor's final stand off with Thanos were so much more satisfying in the moment and, ultimately, heartbreaking. We're still waiting to see how Earth's Mightiest Heroes will get their vengeance in Avengers 4, considering all of the rumored that have been flying around in recent weeks. The predominant fan theory has to do with time travel, and many people think the Avengers will actually journey back into the bast at some point in order to finally defeat Thanos. THis has been supported with recent rumors of dead characters returning in the new film. Frank Grillo, who played Brock "Crossbones" Rumlow in the Captain America movies, said that his character would be returning in Avengers 4 while appearing on the UFC Unfiltered podcast with Jim Norton. "He [Crossbones] makes an appearance in the next Avengers movie. But it's a flashback," Grillo said, joking that he won't be appearing in anymore films because he's too old. "Yeah and I'm allowed to say whatever I want because I'm never doing another Marvel movie." Doctor Strange actor Benedict Cumberbatch downplayed his return, sticking to his guns and not revealing any spoilers. "I’m dust, baby," Cumberbatch said on The Tonight Show With Jimmy Fallon. "I’m just out there. I’m in the ether. I’m probably part of your food chain. I’m in your stomach somewhere." We'll see how it all works out when Avengers 4 premieres on May 3, 2019.